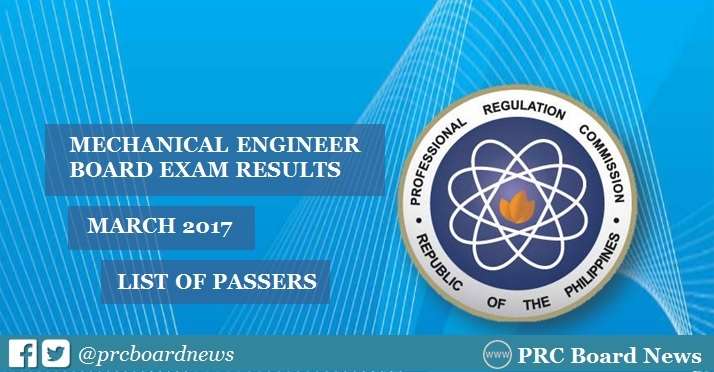 The Professional Regulation Commission (PRC) and the Board of Mechanical Engineering released results of March 2017 Mechanical Engineer (ME) and Certified Plant Mechanics (CPM) board exam 3 working days after the last day of exam. The complete list of passers, topnotchers (top 10), top performing schools and performance of schools are available on this page as announced online on Wednesday, March 22. UPDATE: 1,083 out of 1,904 passed Mechanical Engineer (ME) and 19 out of 39 passed Certified Plant Mechanics (CPM) passed board exam. PRC administered the licensure exams on March 18 and 19 in the cities of Manila and Cebu. Three days before the exam, Baguio City as test venue was cancelled due to the low turnout of applicants. The Board of Mechanical Engineering is composed of Engr. Jesus M. Redelosa, Chairman; Engr. Fernando S. Guevara and Engr. Mirardo C. Malazarte, Jr., Members. Examinations for ME board exam covered the following subjects: industrial and power plant engineering (March 18); mathematics, engineering economics and basic engineering services, machine design, materials and shop practice (March 19). Meanwhile, CPM exams covered the following: elements of power plant machinery, shop machinery practice (March 18) and elements of industrial plant machinery (March 19). According to PRC Resolution No. 2016-1019, the target release date of Mechanical Engineer board exam results is on Wednesday, March 22, 2017 or in 3 working days after the exam. In September 2016 exam, results were released in 3 working days after the test. 3,110 out of 4,470 passed the Mechanical Engineer Licensure Examination and 40 out of 68 passed the Certified Plant Mechanic Licensure Examination. In March last year, results were released also in 3 working days. A total of 910 out of 1,645 passed the mechanical engineering licensure exams while 33 out of 53 hurdled the CPM exams. Batangas State University (BatSU) topped the March 2016 Mechanical Engineer Licensure with 96.72% passing rate. In September 2016, University of the Philippines (UP) - Diliman ranked first with 100% passing rate. BatSU was on second spot with 98.96%. Which school do you think will top March 2017 Mechanical Engineering board exam? PRC Board News will update this page immediately for the list of passers, topnotchers and performance of schools once results are out online.